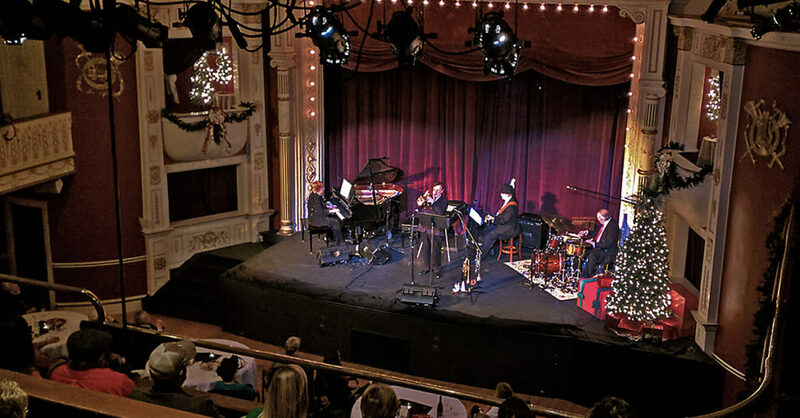 The name of the band comes from the 1947 jazz standard, “On Green Dolphin Street.” Although the group members enjoy venturing into more contemporary styles, their main goal is to encourage people in the area to understand, enjoy, and embrace jazz. The selections range from swing to Latin, from bebop to blues. 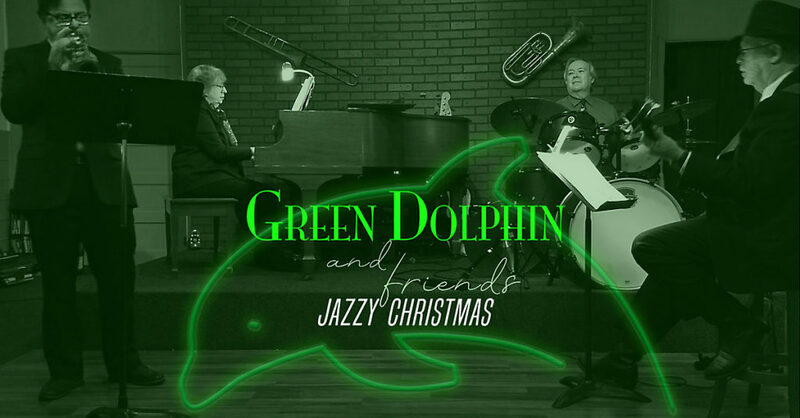 The group’s concerts consist primarily of traditional jazz, featuring well-known jazz standards such as “All of Me,” “Take the A Train,” ” Fly Me to the Moon,” and “I’ll Be Seeing You.” Green Dolphin will also perform many holiday tunes. Just the perfect mix to put everyone in the Christmas spirit. The quartet is based at Black Hills State University and performs for special events in the region. Christopher Hahn has played with jazz musicians such as Bobby Shew, Slide Hampton, and Gary Foster; worked with Wynton Marsalis and Mike Vax, and played in backup bands for The Temptations and The Four Tops. He is currently the “first call” area trumpet player and performs lead trumpet with the Dave Martinson Big Band and The Happy Wanderers big band. He also has played with area funk bands, Outer Space Real Estate and Tastee Freeze. Hahn recently completed his doctorate in music at Colorado State University. When not on the bandstand, he is the director of the Black Hills State University Jazz Ensemble and the Dakota Chamber Orchestra. Janeen is a jazz pianist who has been a member of Straight No Chaser, Round Midnite, The Happy Wanderers Big Band, Tommy Matthews Big Band, and the Northern Hills Dixieland Band. She has been performing with Green Dolphin for seven years and performs every weekend in a piano/bass duo at Romas Ristorante in Spearfish. Larsen holds advanced music degrees from the University of Wisconsin and the University of Florida. She has had a long career as a university music educator. Terry Rathbun is an accomplished and versatile drummer who has twice been inducted into the South Dakota Rock and Roll Hall of Fame. He began performing with bands at the age of thirteen and currently plays regularly with the trio Sugar Free Jazz and the big band Happy Wanderers in Rapid City. He has been a member of Zacharian, The Ride, In the Mood, Some Time Ago, and The Great Northern Jazz Orchestra. Terry has also played with a host of national recording jazz artists such as Harry Allen, Eddie Harris, Sabina Lilly, Greg Abate, The Phat City Band, The Drifters, The Shirelles, The Coasters, and much more. He has performed each year of the Deadwood Jazz Festival, the SDSM&T, and the BHSU jazz ensembles. In addition to a full performance schedule, Rathbun has served as a drum clinician, jazz festival adjudicator, and college jazz instructor for many years. He currently has a private drum studio in Rapid City. Bassist Gary Renner has managed and performed with the nine-piece big band, The Happy Wanderers, for more than 25 years. The Happy Wanderers have performed at the Mountain Grand in Deadwood, Main Street Square in Rapid City, the Central States Fair, and for a multitude of dance events and festivals throughout the region. Renner is an original member of Green Dolphin and performs in the Larsen/Renner Duo for area conventions, weddings, and other events. This year, the folks above will be joined by some rather talented jazz musicians in their own right. The exceptional talents of local singer/songwriter Jami Lynn are always welcome on any stage. Although she has roots in the old-time country and folk music from childhood, her love for the great ladies of jazz developed right alongside her love of folk traditions. While studying classical voice at the University of South Dakota, Jami began her foray into jazz performance. Solo jazz pieces made famous by Billie Holiday, Fats Waller, and Gershwin always work their way into solo performances. She has often sung with the Sioux Falls-based Dakota Jazz Collective as well as the jazz/funk band, Polyphase. Jami Lynn headlined a jazz performance to a sold-out crowd as part of The Matthews jazz series in October 2017. When not performing for jazz or folk audiences, Jami brings music to elementary students and hospital systems through the SD State Arts Council’s Artists in the Schools program and Touring Artists program. Guitarist Ward Johnston is an accomplished jazz musician and educator originally from Colorado Springs, Colorado. He attended Berklee School of Music and Denver University for a degree in Jazz Guitar Performance. He also received a masters from Northern Arizona University in Music Education. He has performed professionally for 18 years in various contexts from jazz duos to a featured performance as soloist with the NAU symphony. In recent years his focus has been composition. His Spearfish Jazz Project group performed at The Matthews as part of their 2017 jazz series. Ward is passionate about moving jazz forward and educating youth to the power of music. He is proud to be the new Director of Bands and Choir at Sundance High School. Rodney Garnett, a flutist, is Professor Emeritus in the University of Wyoming, Department of Music. He has also has worked extensively as a freelance musician in orchestras, jazz and chamber music ensembles, recording studios, and folk music ensembles, including 20 years with the Irish band Colcannon. He is a recipient of the 2003 Wyoming Governor’s Arts Award and the 2008 University of Wyoming Internationalization Award. He continues to be an active performer and teacher, utilizing many styles and forms of flutes while collaborating with colleagues around the world to learn more about musical improvisation and creativity. Most recently, he has been living in Spearfish, where he coordinates a Balinese Gamelan ensemble and is featured as a guest soloist at Black Hills State University music performances. Joel Adams holds a B.A. in music from the University of Minnesota-Morris and an M.M. in music performance from Southern Illinois University-Carbondale. Since moving to Spearfish, he has been involved in numerous different musical groups of all styles, playing both bass guitar and tuba. He has been a featured soloist with the Black Hills State University Concert Band and a member of performance groups such as the Spearfish Jazz Project, Heavens to Murgatroyd, Black Hills Brass Quintet, Funk Nasty, Violent Hippy, Camp Comfort, and Strings and Tuba. He performed with Ward Johnston as part of The Matthews 2017 Jazz series in May 2017. This entry was posted	on Saturday, February 10th, 2018 at 12:03 pm	and is filed under News & Blog, Upcoming Live Shows. You can follow any responses to this entry through the RSS 2.0 feed. Both comments and pings are currently closed.